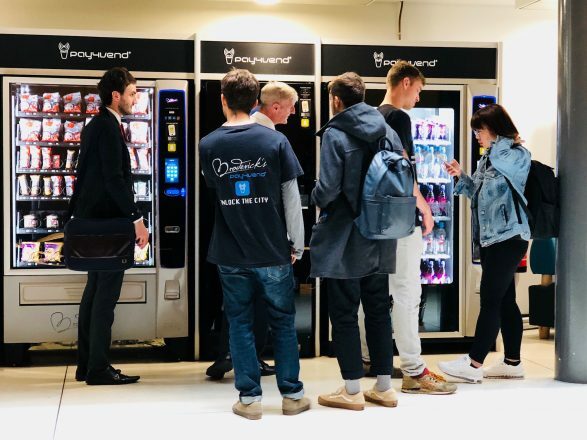 The Pay 4 Vend app is the result of a major collaboration with Italian tech giant COGES and students at Manchester Metropolitan Business School. 8 business students joined Broderick’s in a year-long placement to perfect the technology. Smart vending machines in three buildings on the Manchester Metropolitan Business School campus trialled the app in 2017. In less than 1 year, the app rolled out across all of MMU’s sites, blazing a trail for further universities. Recharge rates of credit on the app are soaring, which reflects in sales for brands. M&Ms promo via the app catapulted sales of the treats into our top 10 bestsellers at locations where the snack had previously been a lower seller. Success of the app has prompted ongoing collaborations. MMU students are now charged with exploring environmental projects for more vending firsts!